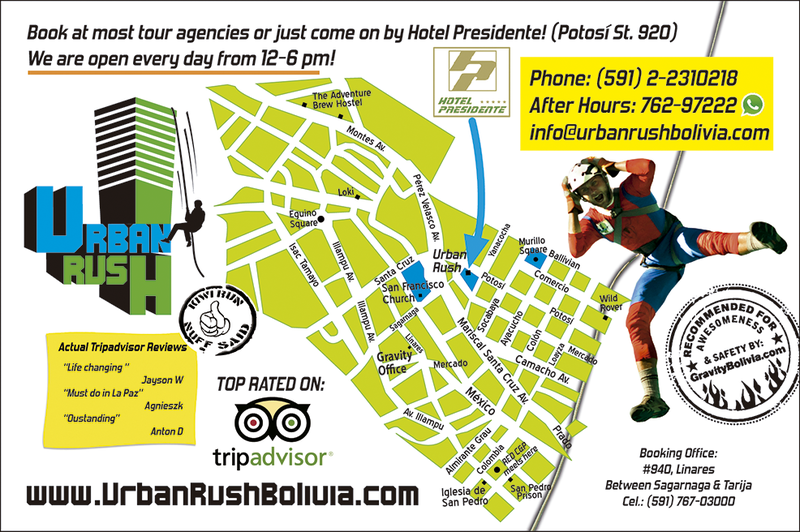 Urban Rush Bolivia – Experience the rush of your life! This 50 meter descent is the new must-do in La Paz! 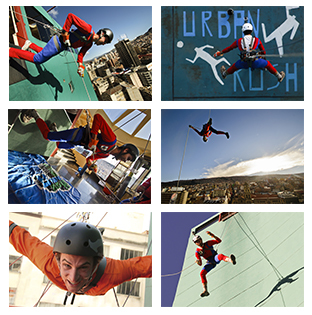 Scale down our wall like Spiderman or a Mission Impossible stunt double, using the traditional rappel/abseil seated method, or the rush of your life – face first method known as Rap Jumping, you can face your fears and push your limits! When you arrive our highly trained guides will fit you into our top of the line equipment, give you all the necessary training, and even walk you through practice runs on our 2 meter wall in the building! Designed and constructed by experts from New Zealand, the US, and Bolivia this activity EXCEEDS ALL INTERNATIONAL STANDARDS. With 2 ropes, and 3 brakes, we ensure 100% safety! And with 50 meters of sweet, sweet descent looking back at you, we’ll get your adrenaline levels up! Right in the center of the city, the views from the 17th floor are spectacular! But the view that really takes your breath away is when you look down 50 meters and the busy traffic below looks like ants! After your practice runs, the guides take you to the big wall! You step up to the platform, and with our expert guides face your fears and make your first few steps. Soon your running, then jumping, and at all times filled with ground rushing adrenaline! Your guides with their 2 brakes can stop you at anytime during your descent if it is needed. When you get about 6 floors from the bottom your guides will stop you for the Free Fall. You will let go of the rope, jump out off the wall, and the guides will let you come flying down to them, where they will safely stop you at our bottom platform. Try not to scream!